The independent Local Government Boundary Commission for England has published its final recommendations for new electoral arrangements for Nottingham City Council. Today’s publication follows public consultation on its draft proposals earlier this year and draws new boundaries for each council ward across Nottingham. All but four of Nottingham’s 20 council wards will change as a result of the review. The Commission’s final recommendations propose that Nottingham should be represented by 55 city councillors in the future: the same as the current arrangement. The recommendations also propose that those councillors should represent fifteen three-councillor wards and five two-councillor wards. Professor Colin Mellors, Chair of the Commission, said, “We are extremely grateful to people across Nottingham who took part in the review. The Commission has looked at all the evidence that was put forward during the consultation. In response to local feedback during consultation, the Commission has made changes to the proposals it published last October. 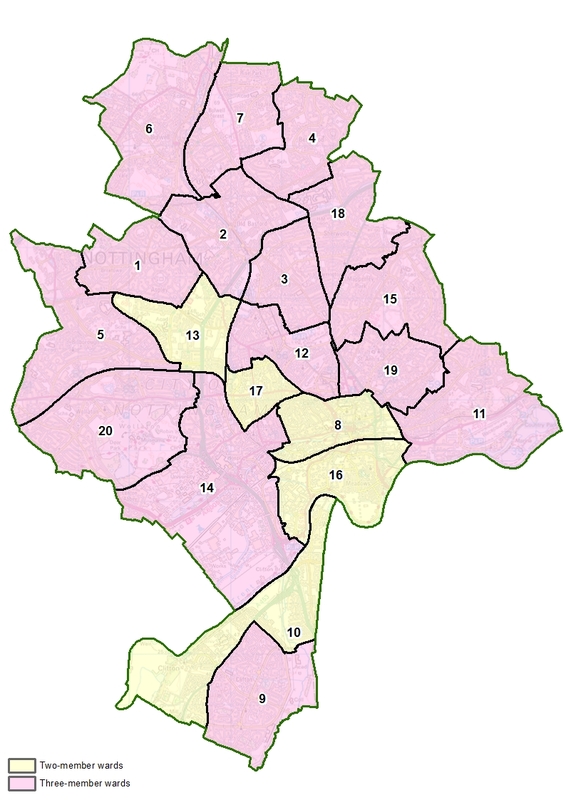 For example, in central Nottingham, the Commission had proposed a Hyson Green ward alongside an Arboretum ward. Local people and organisations argued that the wards would divide communities that shared local ties and facilities. In response, the Commission has changed its recommendations and proposes to combine both areas in a single ward to be represented by three councillors. The ward will be called Hyson Green & Arboretum. Similarly, the Commission has changed its recommendation for separate City and The Park wards. Feedback during consultation suggested that many people living in the proposed The Park ward used facilities and amenities in the city centre and that the two areas should be combined into a single ward. The Commission found the local evidence to join the two areas together persuasive and now proposes a two-councillor ward to cover the central part of Nottingham. The ward will be called Castle. To the south of the city centre, local people argued that the Commission’s draft recommendations for its Embankment and New Meadows wards would split the Meadows Estate. The Commission has therefore re-drawn the ward boundaries in the southern part of the city to create a Meadows ward which unites communities and facilities and will be represented by two councillors. In the south west of the city, residents commented that the Commission’s proposal for a Clifton North ward and a Clifton South ward would divide the Clifton Estate. As part of its final recommendations, the Commission has changed its proposals in this part of Nottingham to create a Clifton East ward alongside a Clifton West ward as a better reflection of community ties in this part of the city. The electoral review of Nottingham City Council is a separate undertaking from the review of parliamentary constituency boundaries which is being carried out by a separate body (Boundary Commission for England) under different rules and legislation. Full details of the Commission’s final recommendations (including maps) can be viewed at: https://consultation.lgbce.org.uk/node/9774.